Summer weather is finally here, at least for us in the northern half of the U.S. and Canada. The longest day of the year, June 21 – the summer solstice – has come and gone. As someone pointed out to me, we’re on the backside of long days here in Sioux Falls and they are only getting shorter. “Kind of depressing,” I said. This can only mean one thing: we are losing precious minutes at the range to sharpen our skills. Whether you are a single-projective guy/gal sharpening your skills beyond 300 yards or you’re deep into the trap or sporting clays season, get out there and take advantage of the long days. One topic of scrutiny and personal opinion is hearing protection. If you don’t wear shooting hearing protection, shame on you. Ask anyone in his or her elder years about hearing. You may have to speak up or repeat yourself, like I have to with my father. He or she will tell you long-term abuse of your ears is no fun in your golden years. Unfortunately, everyone you talk to about the “best” hearing protection will give you a personal “best” answer. That’s why there are so many options for hearing protection. Wade with me into the deep end of the pond and we’ll cut through the “insider-baseball” information and try to simplify. The end game with shooting hearing protection is decibel reduction. The greater the decibel reduction, the better. What’s the threshold for protection? According to OSHA, a conversation is about 60dB and the threshold for pain is about 140dB. 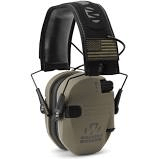 Anyone exposed to 85dB for more than eight hours must wear hearing protection. Exposure to about 110dB for just one minute can cause permanent damage. What is the decibel level of a firearm? What was the threshold of pain again? You got it – shooting a firearm without ear protection puts you in harm’s way. Now that we know what our ears can take, what is the best way to help protect them? When shopping for hearing protection, look for its Noise Reduction Rating (NRR). Every product marketed to help protect your ears and reduce noise has this rating. The higher the number, the better. If the product doesn’t list the NRR, stay away from it. Most of the cheaper foam ear plugs offer decibel reduction in the low 20s to low 30s. That’s not bad for the cost. But be careful – the NRR assumes the plug is seated completely in your ear. Ineffective seating is the largest issue with these plugs, and most people don’t use them properly. 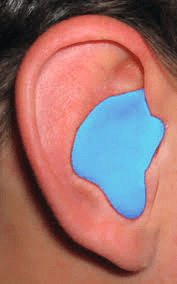 Simple foam ear plugs are fine for inexpensively protecting your hearing (if used correctly). Quite frankly, though, I don’t understand spending $3,000 on a firearm and only $1 on a 10-pack of ear plugs. What costs more, good ear protection or the hearing aids you will be buying in your elder years? If you are looking for the Cadillac of foam-insert ear protection, look for custom-fit ear plugs. They come with instructions to insert the provided material into your ear and wait. The material dries and forms to your ear. They provide their claimed NRR since they fit properly into your ear. Instead of about $0.25 a pair, they cost around $15 a pair. But that’s still cheap for what they do. Looking for the best hearing protection available? Noise-canceling ear muffs are about the best you can get. They come in a range of qualities and prices, from about $20 to more than $100. They electronically measure and dull sound in fractions of a second. Many allow you to hear a normal conversation while wearing them. When the bang goes off, however, they immediately compensate to protect your ears. You’ll find many brands out there with lots of options. Like to listen to music while shooting? Many options have you covered. Although noise-canceling ear muffs are likely the best and most convenient, they are also the most bulky. Many people don’t like all that bulk at the side of their head as they shoot at the range or on the sporting clays course. I could continue go on. The reason this topic is so complicated is because every ear is shaped differently and everyone has his or her preference. In the end, find something that combines comfortable with the highest NRR rating you can find. A brand I like has the slogan, “Protect it, or lose it.” I couldn’t have said it better. As always, happy shooting…and be careful, especially with those ears.